After setting a phenomenal trend on PC and selling tremendously well on numerous consoles, Mojangs incredibly addictive world-creation game Minecraft has made the jump to the Wii U! Play in creative mode, taking your pick to the environment to whatever you can conceive of. Create buildings, caverns, landmarks... youre only limited by your imagination. If you like, you can invite a bunch of friends along to help you build a masterpiece worthy of showing the entire world. Alternatively, use your building skills to stay alive in survival mode. Be quick about it, because at night monsters come out to play, so you need to make sure that you have made preparations for you (and your friends) to stay safe until dawn. 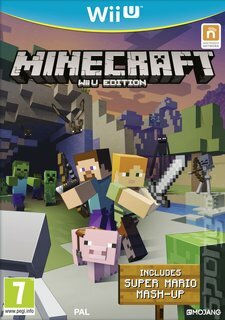 This Wii U Edition contains the base game, as well as numerous other content packs released since Minecraft first appeared. Nintendo fans are also in for a special treat if they take their console online. The free downloadable Super Mario Mash-Up Pack gives players 40 new Super Mario-themed skins, including the likes of Mario, Luigi and Princess Peach and trouble-makers like Bowser and Wario. World and item textures will also be redone, meaning players can build their own Mario-based landscape while listening to 15 pieces of music from Super Mario 64.